How it looks when Nissan goes extreme with the pickup truck we had a chance to see at the 2016 Detroit Auto Show. With the aggressive and unique styling, beefed off-road hardware and nicely trimmed interior, the Titan Warrior is one impressive truck. However, there is a big problem with this unique machine. The Titan Warrior is now just a concept model and it would definitely look much better on the road or while pushing its off-road hardware to the limits on some rugged terrains. Fortunately, according to the latest reports from the industry insiders, Nissan is close to giving the green light for the production. Nissan hasn’t commented on that, but this model could challenge Ford’s Raptor model when it arrives sometime in next year as the 2018 Nissan Titan Warrior. Nissan presented the Titan Warrior Concept with the styling it calls “modern armor”. Indeed, with the matte-gray paint, gloss-black elements, massive tires and sharp edges this model looks ready-for-the-battle. We hope that the styling of the Concept version would be carried over to the 2018 Nissan Titan Warrior if it reaches the production. What we don’t see as the production-ready elements are headlight and taillight units. Before the production, the model might also lose some of its trim inserts. The quad exhaust setup should’t also see the production but other components don’t look far from the market version. The black grille looks unique among other Nissan’s trucks and sculpted hood with functional air intakes would also add to model’s appearance. If it comes to production, we expect this model with similar fender flares and massive all-terrain tires. Nissan’s Warrior would also feature higher ground clearance than the conventional XD version. It would likely come in the crew cab style only. Interior of the Titan Warrior is expected to be trimmed similar to the concept model. The black color will dominate but the orange accents on the dash and seats will add a unique flavor to model’s interior. It should also include aluminum steering wheel spokes and the center stack with Nissan’s latest infotainment features. Other features this model should include are the running boards, heated front seats, premium sound system, cooled front seat option, dual-zone climate control, heated rear seats, etc. Under the hood of the Warrior Concept, Nissan placed unmodified 5.0-liter turbodiesel V-8 engine from the Cummins family. The same engine produces 310 hp and 555 lb-ft of torque in the Titan XD. Nissan combines this engine with the six-speed automatic transmission. 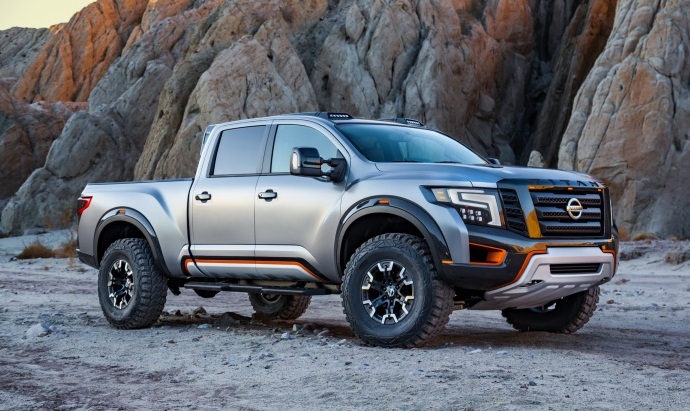 Unfortunately, there is nothing in rumors about would Nissan change something if it launches the 2018 Nissan Titan Warrior. Expectations are that production version will get modified and more powerful diesel version. It might also change to the petrol engine with the higher number of ponies. On the other hand, this model should ride on the long-travel suspension setup. The suspension would also feature more robust elements and model should also employ improved axles. Nothing has been officially said from the company about the 2018 Nissan Titan Warrior. According to industry speculations, we should expect this model sometime in 2018. The price of this model would be much higher that the base XD which goes for around $30, 000.